The Main Street Market began as a traditional Saturday market in a parking lot. Vendors rented tented booths, which they put up and took down every weekend. As the market became more successful, it was given a permanent location in a downtown-parking garage. The new space needed to be warm and inviting (contrasting its parking garage location), and as flexible as the original parking lot configuration. The new booth system was to become permanent yet retain the ability to house varying occupants. The booths also had to provide signage opportunities and designate leasable square footage. Like any city project, the entire system and interior had to be affordable and easy to assemble. The interior finishes reflect the exterior environment: the floors are mottled green and the walls and ceilings are sky blue with a bright blue trim. These colors reflect the light from the windows and skylights bringing the outside into the shallow section of the market. All fixtures including the booth system are galvanized metal and their reflective quality disappears in the natural light. 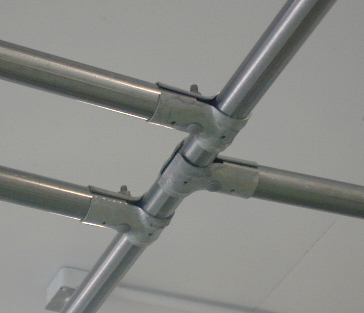 The booth systems are composed of standard fencing components. They are designed so one person can adjust them. The multiple bars of the frame are arranged to provide multiple signage and storage opportunities. The frame is also constructed with a minimum presence so that each vendor may design their space as they wish.